A hand portable receiver that will play a melody, and/or vibrate when a signal is received by a compatible LRA series transmitter. Use in conjunction with the LRA-DCRX or instead of it for more mobility. 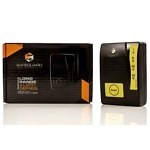 This Small, Portable Receiver Allows You the Freedom to Move About Your Business and Stay Connected and Notified of Visitors! The LRA-VPRX is a small, portable chime receiver compatible with all Safeguard Supply LRA transmitters and receivers. Simply pair this receiver to a compatible transmitter and when the sensor or push button sends the wireless signal, the receiver will play a chime sound, vibrate, or both. Once paired to the sensor, simply clip the receiver on your belt or pants and you will receive instant notifications when the sensor is triggered. Unit will play a chime sound and/or vibrate when it receives a wireless signal from a compatible transmitter/sensor. Operates at 915MHz and pair with the transmitter using a random code to prevent interference. Pair up to 4 compatible transmitters with each receiver. Each receiver will play a distinct sound for each paired transmitter. LED lights each zone with the respective sensor triggers it, giving you a visual indicator along with sound. Powered by 2 x AA-size alkaline batteries.